So, I made 4 lovely appetizers for the evening, and man, it was fun. I had the luxury of hanging out with adults only for 3 hours, feed them, and drink the home seller’s delicious wine. Can’t beat it. These spicy sausage, sweet potato, and fig skewers were definitely the highlight of the evening, and thus, I will share with you lucky folks. I was inspired by a recipe from Yotom Ottolenghi’s book Jerusalem, which is a sweet potato and fig salad with a balsamic reduction. I decided to make it into an appetizer, and it works… really well. And it’s simple too. 6 spicy sausages, each sliced into 8 pieces. Use something that won’t fall apart when sliced. I used Aidell’s Habenero Pepper Jack Sausage. Bake the sweet potatoes for 15 minutes. While the sweet potato is in the oven, put your sausage on another baking sheet and spread out evenly. Once the 15 minutes is up, turn your sweet potatoes and put back in the oven, ALONG with the sausage for another 15 minutes. 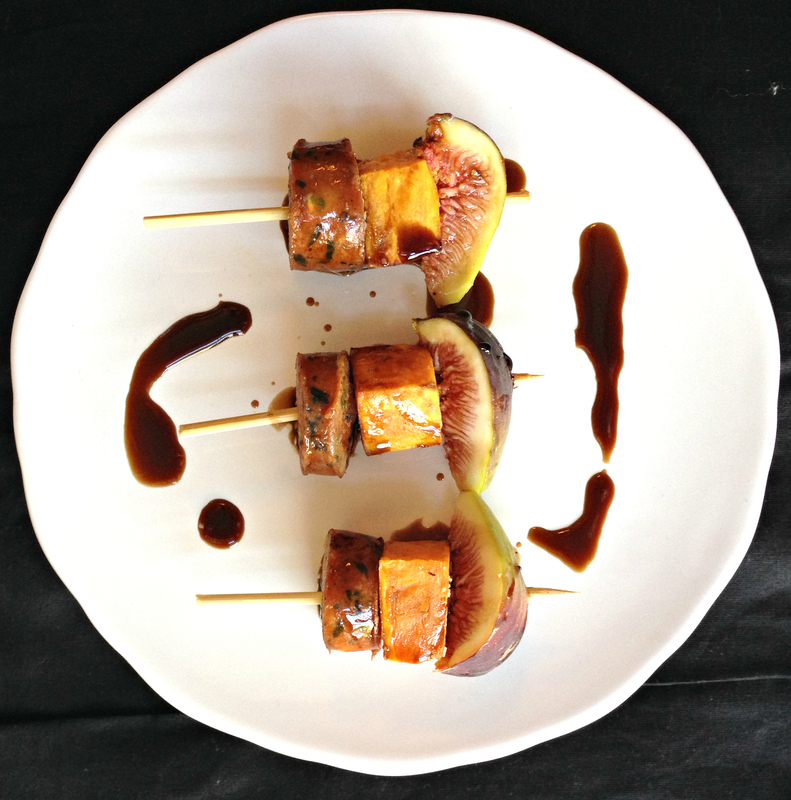 While everything is cooking, you can make the balsamic reduction to drizzle over the skewers. Yum. In a small saucepan, add the balsamic vinegar, sugar, and jalapeno. Bring to a boil and then simmer for 3-4 minutes until it’s the consistency of honey. Remove from the heat. 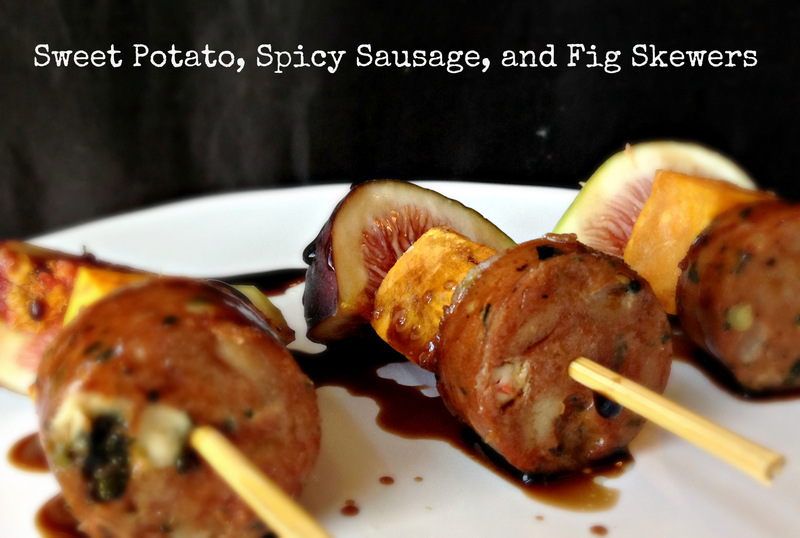 Once your sweet potato and sausage have cooled enough to handle, put a piece of sweet potato, a piece of sausage, and a piece of fig onto a skewer. Plate and drizzle with the balsamic reduction. Eat. Then notice the sound of angels singing your praises. “Lalalala”- that’s the angels singing. Thanks again Erin Lewis (my bestie) and Missy Walden, for offering me this fantastic catering opportunity!